Last year at Cosmoprof North America, China Glaze shocked me with Gelaze and this year they've surprised me again. 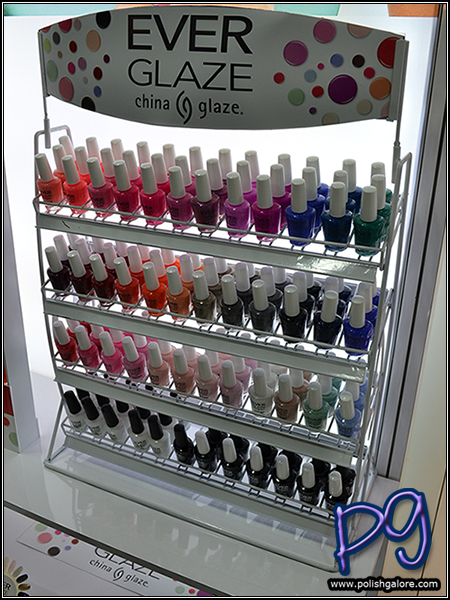 Coming in January 2015 to Sally Beauty Supply is the newest invention in the line of China Glaze products - Ever Glaze. 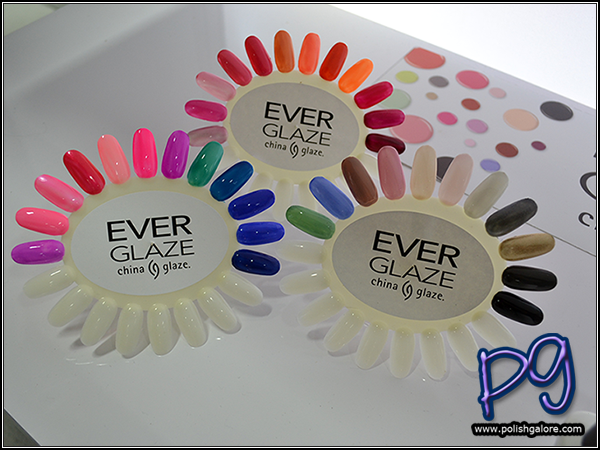 Ever Glaze is a self fusing color lacquer that has a special top coat that does not take a UV or LED lamp to cure but the results are gel like quality with 7 day wear and removes with just normal acetone based polish remover. -It lasts for 7 days. -The self fusing top coat hardens like gel but without the use of a UV or LED lamp. -To remove, just use normal acetone based polish remover. All 36 shades are brand new to the China Glaze line (no matchy matchy colors like the Gelaze + China Glaze collections) with a new bottle shape. The brush, however, is currently the same as China Glaze (although that may change). No color names have been released at this time but it's just a matter of time now that the cat is out of the bag. The above photo is the salon display for Sally's (not final mock up, so yours may look different come January 2015). LOOK AT ALL THE PRETTIES. And a final display of the polishes. So what do you think? For those who have heard of CND "Vinylux" (hello, I just posted a water marble with it) or Young Nails "Caption", this is the same concept. Gel like quality from a lacquer without the harsh removal process. Makes me happy. How about you? What are your thoughts on it? 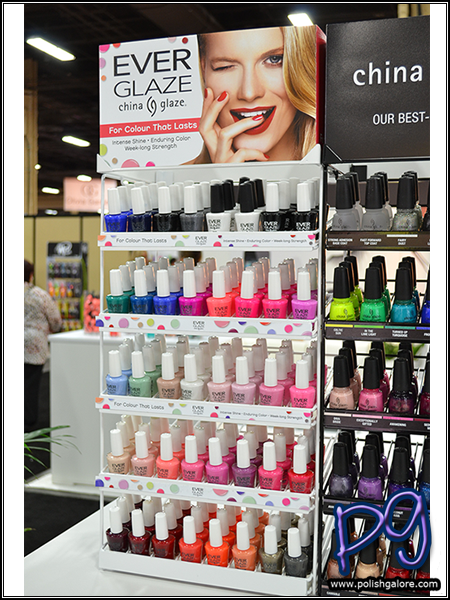 Stay tuned to PolishGalore for more show coverage of China Glaze and Cosmoprof North America 2014! I am super excited to try these out! Wish they had some existing colors, though (ahem Audrey?)! I'm interested to see if any colors are close to being dupes for existing colors because that would be nice. Fell in love Saturday. And her name is EVER GLAZE!! When I walked in to Sally's, the girls were putting it the new line. I almost fainted. OMG so many gorgeous colors!! There's a red so red, that Christian Louboutin himself would be jealous! All of the colors are new and different. Not dupes at all or coordinates like Gelaze. All 48 colors have new names and are new shades. Some may be a shade or two lighter or darker than their original predecessors, but they are their own colors in their own right. The one I really was drawn to was #ultraorchid 82304. It's a gorgeous creamy kind of lighter fuchsia pink. It's the pink I've been searching for, for a while now. It has just enough of a blue hue in it for my skin tone. The system: Primer, Color, Top Coat. The brushes for all three are of the wider professional type. Love that! The primer: very thin and watery consistency. When you apply it, you feel like it's not there. Once it starts to dry it becomes very tacky/sticky. It's now ready for the color. The color: The formula....OMG THE FORMULA!! It's amazing. Thicker than a regular polish but not as thick as most gel-like polishes. Flows onto the nail beautifully. First coat goes on very thin and sheer. Be sure to wrap your tips. Let dry a few minutes then apply second coat. In my opinion, the color is so beautifully pigmented and formulated that I only needed 2 coats (the pic below is only 2 coats). Let dry. The top coat: I have two words...PURE! MAGIC! I might even dare to say that it's also self leveling like a gel is. Has a great consistency. Flows on the nail very nicely. Not as thick as the color but definitely not as thick as a gel. Again, be sure you wrap the tips. Let dry. Once dry, you have this AAAHMAZING smooth and shiny as glass, hard as gel finish. The top coat takes about 2-3 minutes till it's dry and you can grab your keys and dash out the door. I've tried the same type of system by two other brands and was severely underwhelmed by at least one of them. The other, was just ok. But #ChinGlaze has hit it out of the park with#EverGlaze!!!! Honestly, I've only had this system since Saturday (seems fitting that it was Valentine's Day, LOL!). Put it on as soon as I brought it home and I'm already in love with it. SO CRAZY IN LOVE WITH IT!!! For some reason the pic didn't load with my comment. I just bought them. Does anyone know how long it takes to dry? Kristine, did you find out the drying time? I just bought some today and painted one nail just now. Its beautiful!!!! Karen, after an hour of drying, it still was able to smudge if bumped. I put it under my UV lamp in hopes of drying it faster. Don't waste your money. I'm not sure if I am applying it correctly as there are no directions and I can't seem to find any information on line. I have applied the primer, two coats of color and the top coat two different times in 5 days and it already starts to peel and chip off by the end of the second day. I was so excited to try this, but I am so disappointed with the results.